Red, White and Everything Nice. The little diner on the second floor of Il Terazzo caught my attention while passing by Tomas Morato. 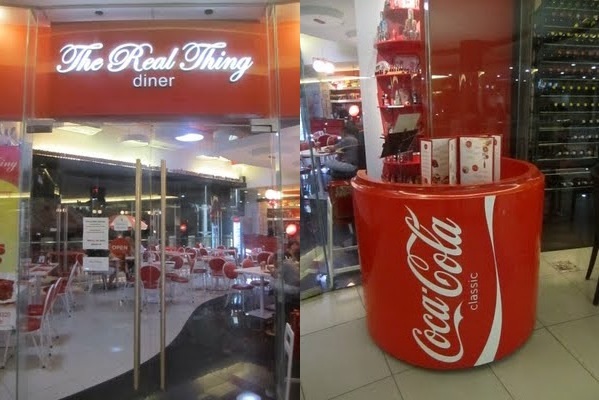 Curious and excited, I searched for food blogs that featured the so called The Real Thing Diner. I was not surprised that a lot of foodies raved and blogged about it already. Aside from the fact that Noelle Cassandra, Asia's only harpist, singer and songwriter was one of the founders, the diner was Coca-Cola inspired. Upon entering, you will be greeted by their friendly staff standing behind a small Cola-Cola podium. 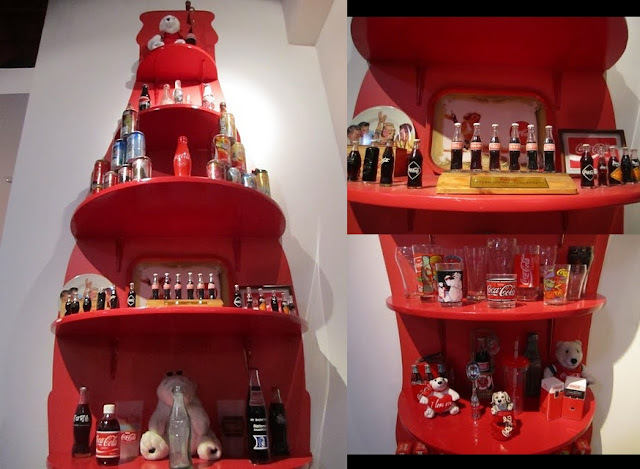 The interior was decorated with Coca-Cola products, they even have a spot on the corner that holds different kinds of Coke bottles and other Coke memorabilia. Articles from magazines featuring the diner were framed and mounted on the walls and soda cans of Coca-Cola products were lined up near the ceiling. Checking out their menu, the waiter explained that almost 80% of their selections are infused with Coca-Cola products. They are basically your everyday cooked meals with a "twist". He recommended the Spicy Sarsi Wings which was a crowd favorite. We opted to have their Share Me! Platter (which was good for 3-4 people) the Wing-It Platter (P699) which had some of their famous best-sellers, the Spicy Sarsi Wings (P199), Coca-Cola Baby Back Ribs (P399), and the Royal Tru-Orange Porkchop (P249). It also comes with three cups of rice and a pitcher of iced tea. Everything on the table had Coca-Cola logos and symbols on it. From the paper mat, to the tissue holder, and to the glass coaster. At first we thought that the serving for each food will be reduced but the waiter ensured us that every item will be served on a whole order size serving. It was really quite a deal since we get to taste everything we wanted from their menu at a lower cost, the pitcher of iced tea that came with it was a plus too. The Spicy Sarsi Wings were excellent! Hands down our favorite dish for the night. It was not the usual buffalo wings we always have but it was really good. I did not find a hint of spiciness in it maybe because the sweetness of the Sarsi glaze overpowered the spiciness of the dish. The wings were richly covered in sticky and caramelized sauce but still kept its crispiness. You could actually taste a hint of Sarsi in the dulcified sauce. The Coca-Cola Baby Back Ribs was our second favorite. It was not barbecue-style, but we still loved it! The platter came with their signature Coca-Cola barbecue sauce which I think resembled to that of the Sarsi Wings sauce. It was not fall-off-the-bone type of ribs but still it was tender and juicy. What I really loved about it is that it had a minimal amount of fat making it all fleshy and meaty. The piquant sauce made it more flavorful and tasty. I'm not sure if it was the spice from the wings or the ribs also has that kick of spiciness in it. I actually think that the ribs were spicier than the wings. The Royal Tru-Orange Porkchop was just so-so. It lacked flavor as if the orange sauce was just brushed over the porkchop after cooking. The meat was not that tender either. I think a little more time of marination would do the trick. The only difference if you order the platter rather than the individual course is that you get no side dishes of mash potatoes, vegetables and fries. Instead, you get 3 cups of rice. We also ordered their Royal Pumpkin Soup (P99) which was basically a pumpkin soup with a tinge of Royal. It was not thick and creamy as I expected it to be. I also found it a little bland for my taste. Nothing really special except for the fact that it was infused with Royal. We still have many dishes to try out at The Real Thing Diner and I'm looking forward to our second visit. mukhang masarap ah! Will order what you ordered. =D great review!